These experiments were performed in an effort to prove that a "pleasant and varied diet " was as healthful as simpler strict diets. Stark kept accurate measures of temperature and weather conditions, the weights of all food and water he consumed, and the weight of all daily excretions. Stark also recorded how he felt on a daily basis. William Stark's self-sacrificing dietary research ended in his death from scurvy, a disease caused by vitamin C deficiency. 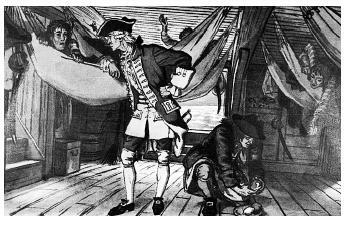 Had he heeded the recent discoveries of James Lind, pictured here giving lemons to sailors, Stark would have known to include citrus fruits in his experimental diet.